Continuing north we arrived at the Naruto Strait and the Ōnaruto Bridge. The Naruto Strait (鳴門海峡) has dangerous whirlpools and eddies, which are imaginatively rendered in the folk dances of the region. 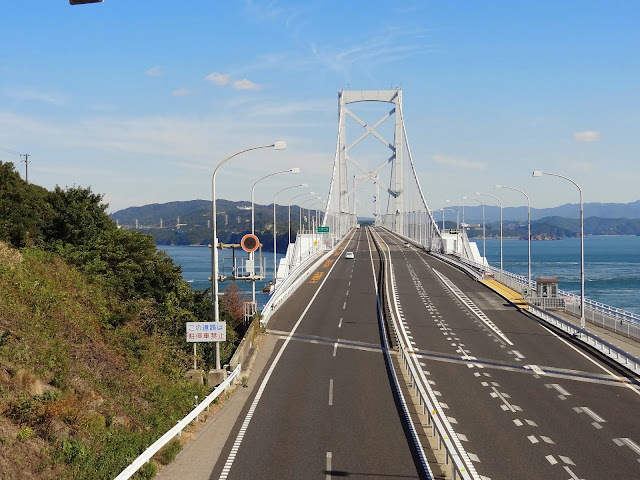 The Strait separates Shikoku Island from Awaji Island and it's crossed by the Ōnaruto Bridge. Originally, they were planning to carry the Shinkansen (bullet train) on the bottom bridge decks of the Kobe-Awaji-Naruto Expressway. Eventually it was decided to carry trains on the Seto-Chuo Expressway instead and the bottom deck is used to carry maintenance crews and visitors under the bridge. Tourists can watch ships navigating around the rocks and swift current under the bridge. 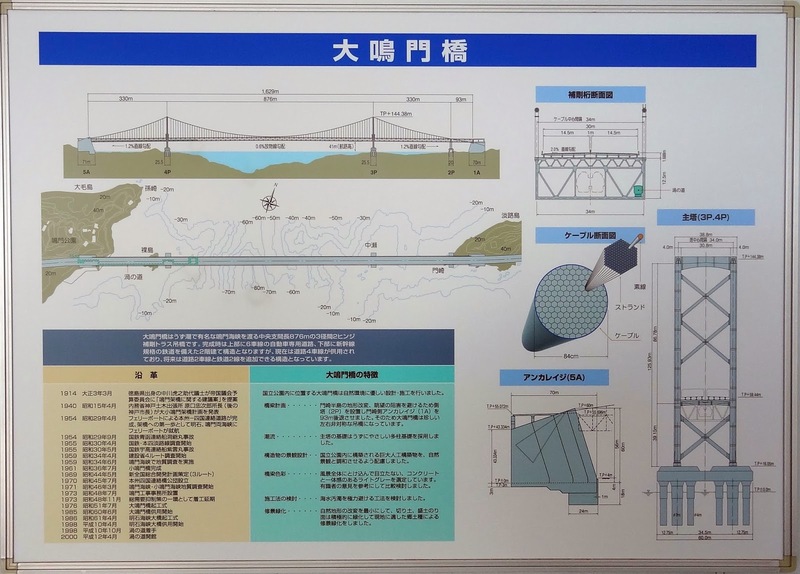 However, the bridge was designed so it could still carry the Shinkansen in the future. Also, the number of traffic lanes could be increased from four to six lanes, but as can be seen in the photo above, there is almost no traffic on this bridge. Because of the hostile environment at the Naruto Strait, everything about this bridge was made extra strong. For instance, instead of two suspenders hanging from the suspension cable at each floor beam, the Ōnaruto Bridge has four suspenders so that two can be replaced at a time. Because of the hard rock and swift current under the Naruto Strait, the towers and pier are supported on large diameter pile caps instead of caissons. The suspension cables were constructed with extra strands to balance the tension in the side tower that supports the short truss span at the end of the bridge. Also, larger diameter wires (5.37mm) were used for the suspension cables. Tokushima Prefecture, Japan Bridges: Ōnaruto Bridge across the Naruto Strait (2) by Mark Yashinsky is licensed under a Creative Commons Attribution-NonCommercial-NoDerivs 3.0 Unported License.